The Nike BHM 2017 Collection is highlighted by their three Nike Basketball signature shoes, along with two iterations of the Air Force 1, the NikeCourt Flare and the LunarEpic Flyknit. The Nike LeBron 14, Nike Kyrie 3 and the Nike KD 9 come dressed in the BHM’s Black, White and Gold color scheme. 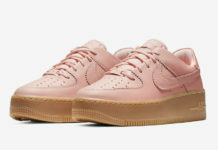 Using the same color tones and detailing are the two Nike Air Force 1 releases, Serena Williams’ NikeCourt Flare and the Nike LunarEpic Flyknit. Look for the entire Nike BHM 2017 Collection to release on February 16th, 2017 at select Nike retailers, including Nike.com.